They raised him on their shields in a moment of great happiness and triumph! The astounding success of Julian’s rise in five short years, from a bookworm to Caesar, was genuinely celebrated by his army and citizens. He had excelled, against all expectations placed upon him, but at a great cost of irritating his cousin. The senior Augustus, Constantius, was always fearful and suspicious of those around him having success, something that truly maligned his personality. The fact that he had watched Julian bring about order along the Rhine really bothered him. Constantius believed Julian had become too popular, particularly among his soldiers. In an attempt to bring him down a peg or two, Constantius sacked and replaced many of Julian’s trusted advisors, but to no avail. In the end he resorted to a plan to strip Julian of his army. While Julian was bringing stability to the west, Constantius had run into problems with Sharpur’s re-emergence in the east in 359. War hung over the east like a heavy curtain, and as hard as Constantius tried to rid himself of Shaphur, he couldn’t conclusively defeat his nemesis. It was around about this time that Constantius concluded that to defeat Sharpur, he would need more money and soldiers. And where better to find what he needed, but right under Julian’s nose. Constantius immediately wrote to his cousin outlining his demands, which included about half of Julian’s army. It’s fair to say that the letter was greeted with shock and disbelief. There is no evidence to suggest that Julian was going to deliberately disobey Constantius request. He did as he was asked with great reluctances and began preparations, but warned Constantius that many of his soldiers who had joined, and those that had families in Gaul would never agree to be sent east. Julian was right to be worried and as predicted his legions burning with anger, sparked an open rebellion at the news. The situation deteriorated further when a circulated leaflet was handed out amongst the troops speaking ill of Constantius. Before long the rank and file of Julian’s army surrounded his palace, shouting and demanding that he appear before them. They began to hail him as Augustus, pleading him to disobey Constantius’ orders. After some deliberation and claiming to have received a sign from Zeus, Julian yielded to their wishes and met with them. At first he sincerely refused to be acclaimed Augustus, but as their terrifying shouts got louder, he at last agreed. They raised him on their shields in a moment of great happiness and triumph and even louder than before proclaimed him Augustus! Following his elevation as Augustus, Julian quickly wrote a letter to Constantius, explaining in detail what had happen and sincerely hoped that they could come to some sort of accommodation. The best outcome would see the two emperors split the empire between them, especially since Constantius seemed forever occupied with Sharpur in the east. But Constantius flew into a rage when he read the message delivered to him by Julian’s envoys. To Constantius, it was simple, Julian’s actions clearly meant war. However, before he could deal with Julian’s so-called insurrection, he had to deal with his running battle with Sharpur. In the meantime, he would tie down Julian in Gaul by openly encouraging the barbarian tribes to revolt along the Rhine. To some degree this course of action worked and prevented Julian from any eastward approach. Almost a year later in the summer of 361AD, the opportunity had finally presented itself for Constantius to finally deal with Julian. At around about the same time, Julian had also become increasingly frustrated by all the stalled negotiations with Constantius, and finally began his own preparations for war. Julian decided that he wasn’t going to give Constantius the opportunity to regroup his forces and immediately invaded the Balkans. Julian reached Naissus, where he stopped to recuperate and spread propaganda leaflets to the citizens of the east. (He was looking for every advantage to gain support for his ‘rebellion’.) It was in early November that Julian made another important decision for himself, to finally begin to openly worship the old gods. It was time that he finally revealed his true self. Whether or not, his intentions were to truly shock and further alienate Constantius, we will never know. His decision though to renounce Christ publicly was fortunate in timing, because before news could spread of the stunning announcement to his pious cousin, Constantius was dead. Julian would discover that Constantius fell ill along the way to confront him, and without warning suddenly died in Tarsus, the province of Cilicia (southeast Turkey). Envoys would bring him further news that with his last breath Constantius named Julian as his successor. One has to wonder here, would Constantius have named Julian as his successor, if he had known of Julian’s betrayal of Christ? I don’t believe Constantius would have allowed a pagan to rule the empire. When Julian arrived in Constantinople on December 11th 362 AD, he was greeted by what seemed like the entire population of the city. They cheered and clapped as if he were a hero returning home. (Julian was the first emperor born in Constantinople.) For the people of Constantinople to have greeted him with such open arms suggests that some of the news of his great military glories must have trickled across to the east. How much of the truth of these stories they actually knew, we don’t really know. I’m sure that Constantius would have censored much of this information or claimed Julian’s glory as his own. Nonetheless, the people of Constantinople first glimpse of Julian, as Brownworth eloquently states, seemed like “a vision of Julius Caesar himself, returned to lead the empire to a new golden age.” Unfortunately what the people of the empire didn’t realise was that Julian harboured ambitions to turn back the clock, to a more pagan past. But first he would lay to rest the murderer of his father in the Church of the Holy Apostles. Julian apparently genuinely wept for his cousin, even though he truly hated him. For Julian, it would also be the last time he ever entered a Christian church again! 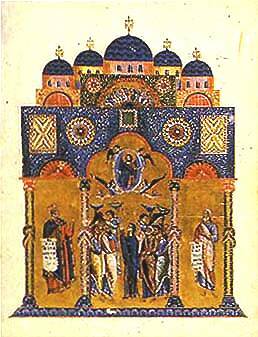 Illumination from the Vatican Codex (1162) which is believed to the Church of the Holy Apostles. “The irony here, of course, is that the soldiers…” & “…a vision of Julius Caesar himself, returned to lead the empire to a new golden age.”, Lars Brownworth, Lost to the West, Crown, 2009, p.p.31-32. “I see before me men who have shown courage and loyalty…”, Ammianus Marcellinus, The Later Roman Empire: AD 354-378, Selected and translated by Walter Hamilton, Penquin Classic, 1995, p.190. Suggested reading – a wealth of interesting information in this article. Reblogged on Windows into History. A while back I reblogged Robert Horvat’s interesting article on Julian the Apostate, the single non-Christian Emperor in the history of Byzantium. Here is the continuation of that series, getting into the detail of how Julian achieved power amidst the intrigues of the 4th century A.D. Great stuff, and I’m looking forward to the continuation!